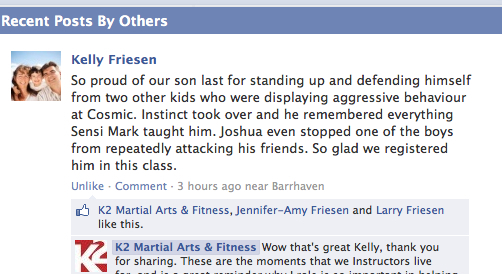 A mother of a K2 Martial Arts student, Kelly Freisen, was so proud of her son Joshua who used the confrontation avoidance and anti bullying techniques taught by his K2 Martial Arts instructor. Little Joshua had a run in with another child who tried to bully him while at Cosmic Adventures. 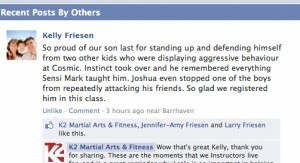 Joshua was not only able to deflect and defend himself against the bullying behaviour for his own welfare, he was also able to use the tools learnt at K2 Martial Arts to protect his friends as well. This types of situations are all too common nowadays. One of our primary goals at K2 Martial is to help children learn to deal with instances in a very calm and decisive manner. 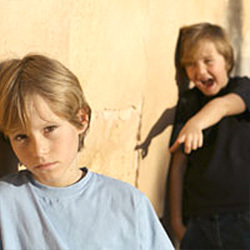 Our Martial Arts curriculum has anti bullying techniques embedded within in it, in hopes that our students will never have to use it, but also the confidence that they will be well prepared if the need arises.